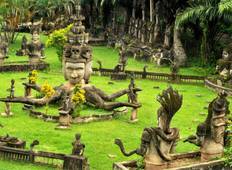 A tour starting in Vientiane is a great way to see Laos. The trips vary from Christmas & New Year to Discovery to Adventure tours and span across 3 day to 16 day itinerary with prices ranging between $46 to $396 per day. "Nice to tour with different people each day"